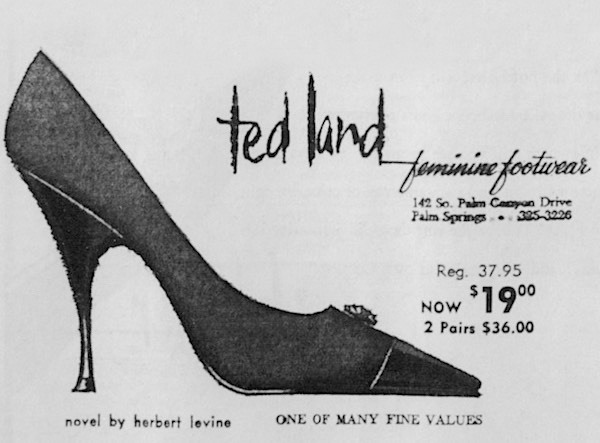 The great profile of the Herbert Levine shoe, urbane as it is, comes from the designing genius of a farmer’s daughter. This erstwhile milk maid is named BETH LEVINE and she is the artistic half of the team of Levine and Levine who personally watch over the birth of 5,000 pair of shoes a week. Beth met and married Herbert Levine during World War II while she was a member of the American Red Cross and planned and directed entertainment for servicemen. 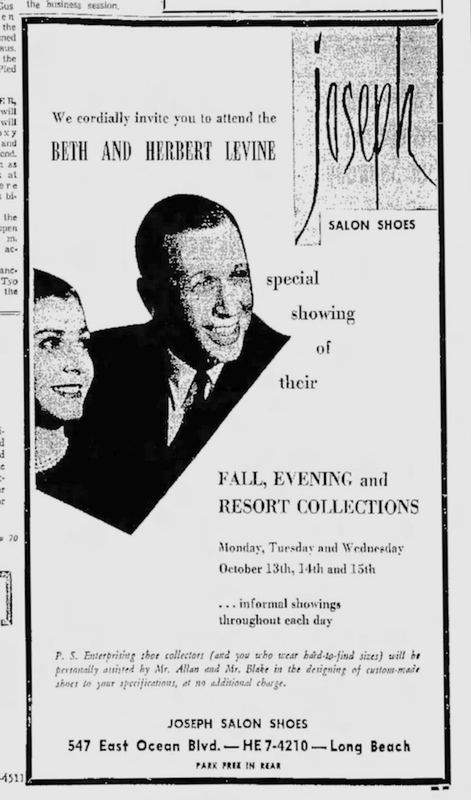 After the war, with the memory of having spent several years on her feet dancing and dashing from place to place, and with the full realization of the persuasive powers of Mr. Levine, she agreed that shoes were certainly a most important item and that Herbert Levine was, indeed, just the one to promote them. 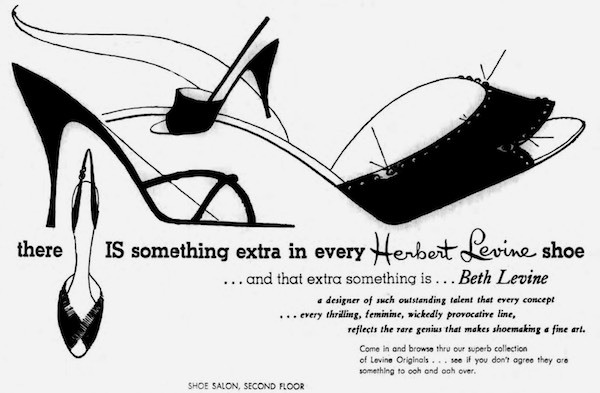 So, in 1948 Beth and Herbert founded Herbert Levine Inc. with the arrangement that he was to handle the selling and business details and she was to be responsible for the designing of the shoes. From the outset the Levine set their goals high. 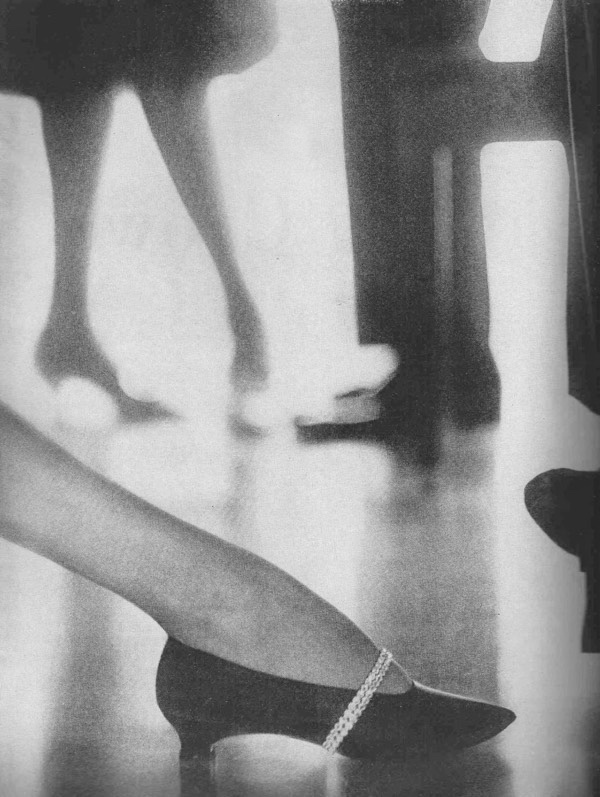 Theirs were to be shoes which literally stood for elegance, fashion and new ideas. To achieve a new concept of shoe fashion the Levines will go almost to the ends of the earth. To this day Beth Levine, who instigated the trend to the extremely slender heel, has designed over 100,000 pair of shoes which have been made in the United States, airmailed to France and there fitted with an unusually slender, tapered heel [the famous Jordan Heel (2)] and then re-airmailed back to this country as a complete shoe. Mrs. Levine is understandably proud of her shoe designs because of the unusual use of fabric, leather and color combinations for which the Levine shoe has come to be famous. During yearly travels throughout the world the Levine personally select, for their shoes, brocades from India, silks from Siam, velvets and silks from France and tie silks from Italy. Although Beth Levine has found it exciting creating such designs as the “stocking shoe”, an innovation in shoe designs which strikingly glamorizes the legs of many of the world’s most famous entertainers including the very beautiful legs of Marlene Dietrich who owns several pair, she believes that the most satisfying thing about her designing work so far has been the creation of beautiful, radically new silhouettes which place as much emphasis upon fit and quality of workmanship as they do on fashion. In private life, Beth Levine keeps as busy a schedule as she does during “office hours”. The Levines live in Lower Manhattan in a spacious terraced apartment. On the home front Mrs. Levine is the attentive mother of a lively three year old daughter. It is especially for little Anna Sam Levine that the designing-half and the business-half of Herbert Levine Inc. spend their weekends on a Long Island farm. But, every Monday morning, it’s back to the city and the hum of business activity for this enterprising pair of talented young shoemakers. Two years later, both unhappy of what they were doing they decided to go independent with the help of Herb’s friend Sidney Kornblum. They established Herbert Levine, Inc. on January 1949 (not 1948). The rest of the advertisement is the usual marketing fluff but at least is faultless when it comes to Beth Levine’s way of doing shoes. Their combined crafts led them to winning the Neiman-Marcus Award in 1954. 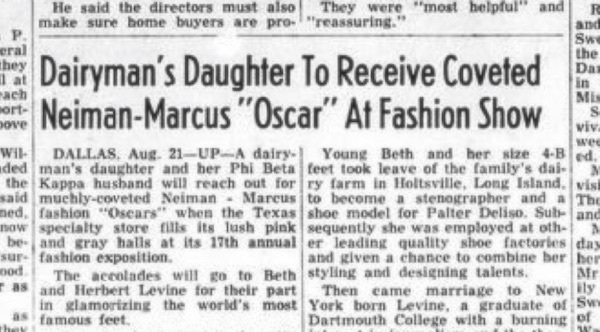 Dallas, Aug. 21 - UP - A dairyman’s daughter and her Phi Beta Kappa husband will reach out for muchly-coveted Neiman-Marcus fashion “Oscars” when the Texas specialty store fills its lush pink and grey halls at its 17th annual fashion exposition. The accolades will go to Beth and Herbert Levine for their part in glamorising the world’s most famous feet. 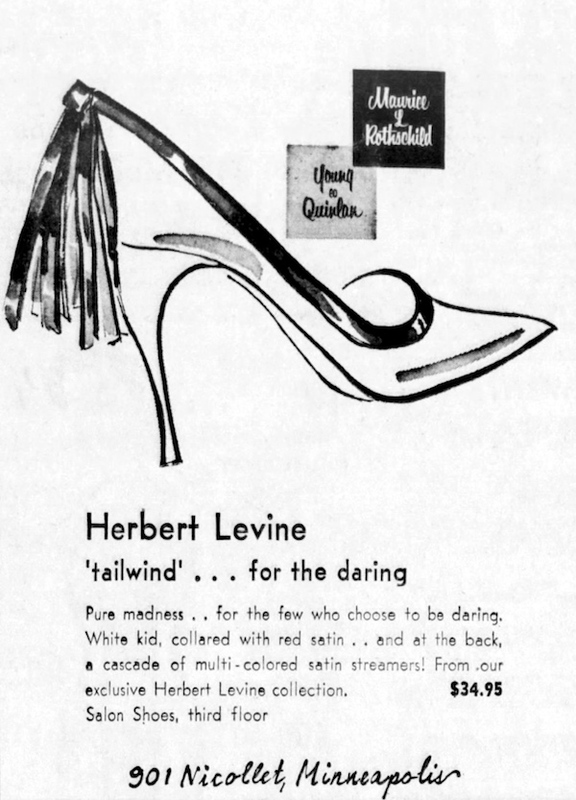 …The young Levine’s are the operators of Herbert Levine, Inc., the sixth largest operation of the shoe industry and now 10 times its original size. And this year the firm will attain a capacity of 5,000 shoes a week. Young Beth and her size 4-B feet took leave of the family’s dairy farm in Holstville, Long Island, to become a stenographer and a shoe model for Palter Deliso. Subsequently she was employed at other leading quality shoe factories and given a chance to combine her styling and designing talents. … the use of gold cloth and brocades from India, silks from Siam, velvets from Lyon, the silks from Como, cottons from England and dress silks from Paris has earned the Levine’s a reputation for fresh and trend-making fashions in exquisite footwear. But they feel their most vital work has been in radical new shoe silhouettes which the industry had therefore felt could not be made to fit. Beth and Herb made shoe history with their importation of a complete wooden heel from Paris - the famous Jordan Heel. (2) And the assembly of a complete resort collection of shoes set another “first” for the famous couple. On our most recent visit to New York City we were keenly disappointed not to see Herbert and Beth - but true to form, they were in Europe discovering new leathers and the like. The Levines have always since their partnership, both personal and professional, been interested in new leather developments, new tanning methods, new textiles and other materials for shoe manufacture, They're also highly sensitive to general fashion trends which indicate changes in shoes. Quite in addition to fabric and leather and general styling, they recognize endless heel interest. CHARLES JORDAN, Parisian bottier - not to be confused with Charles Jourdan, founder of the brand of the same name. If you were mislead - like us - by Caroline Cox’s “Vintage Shoes” you might be aware that Beth Levine worked a brief stint at I.Miller but never as a designer, let alone their chief designer.